hotspace1966 wrote: In my eyes Queen had always done more than enough to be considered a success in America regardless of the situation that arose following Hot Space and IWTBF video. Completely agree; just a shame that the USA - apart from the true fans, of course - does not show them the respect they deserve. Thankfully, it is a big world we all inhabit; there are many other countries out there who do appreciate this band. As an American fan that NEVER abandoned the band since early 1978, I appreciate your recognition of the loyal fans that have always been here! I am also glad that everyone knows there are an abundance of us Queen Fans in the USA. I remember "We Are The Champions" shaking the walls at our pre-game football rallies in high school 1979. You're never too old to listen to the early Queen. So Mike Myers has started filming scenes with Rami; I wonder who he is going to depict? I am guessing an early American Queen promoter or record producer. Wonder if Brian and Roger (or John!) could be snuck into the film somehow. Maybe in a crowd or just in the background somewhere. I wonder if we'll see Freddie singing along to Paul Rodgers in the bath. Jimi wrote: Roy Thomas Baker !!! Strangely, I think that would work. I don't know if anybody has been cast as the late Norman Sheffield, Mr. Death on Two Legs himself. If Sheffield features in the movie, that could be a potentially juicy role for an actor like Mike Myers to play. Especially if they depict him as described in the song. What actor wouldn't want to play "The King of the Sleaze" in a movie about Queen? That part could be a key player in the early years of the band. Of course if he played Roy Thomas Baker, they could show him headbanging to Bo Rhap for a second time in a movie, this time from the producer's chair. That might be too good of an image to pass up! So happy about Tom Hollander playing Jim Beach - one of my favourite British actors today. Excellent. The film is definitely going to focus on the early 70s too; just seen a tweet from a vintage fashion company who were supplying pictures of their Biba range to the film. Latest pic of the 'Bo Rhap Boys': looks like they are becoming a close knit bunch...and Gwilym looks more like Brian every time I see him. On Joe Mazzello's personal chair there you can see there's even a logo for the film already. Might be a temp one but quite effective I think. Just caught Spectre, the last Bond movie recently. Have to say Ben Whishaw could have made a great Freddie. Something about his speech and accent and demeanour, and how he moves, made me think of a 70s era Freddie. Still, here's hoping Rami, who's a terrific actor, will knock it out the park. Yes, I noticed the logo on his chair - I quite like it, too (especially with Freddie's famous pose in there). I like Whishaw and think he is a competent actor, but I just can not see him as Freddie - physically, I think he is way too slight and fragile and his face is not strong enough character-wise for me. I think Rami is going to nail this anyway - bloody good luck to the fella. musicalprostitute wrote: So happy about Tom Hollander playing Jim Beach - one of my favourite British actors today. Excellent. BitterTears wrote: Wonder if Brian and Roger (or John!) could be snuck into the film somehow. Maybe in a crowd or just in the background somewhere. 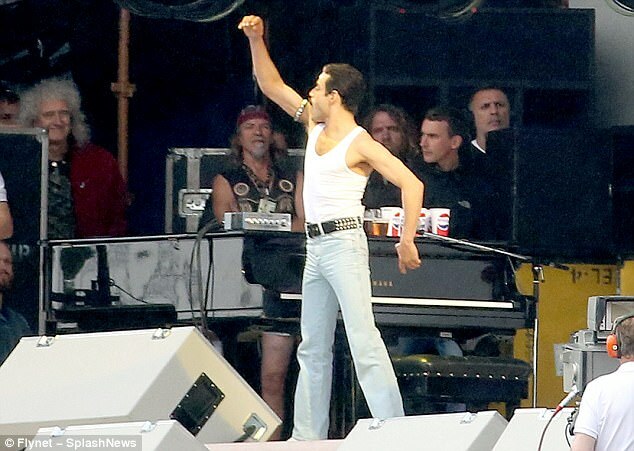 Brian is in the back during the Live aid bit. Standing amongst others were actual crew were so he should be visible in the background. He was there during rehearsals, but he obviously will not be in the film - that would be beyond ridiculous...unless of course he really was hidden away in the background and virtually unrecognisable.